The SA-SOFI pilot project has been conducted over the past year (2008) in parallel with the Presidency’s Development Indicators reporting initiative which presents an assessment of the state of the nation. The Presidency’s report is currently under discussion. The SA-SOFI complements the contemporary indicators by attempting to indicate the changing state of the future and shows whether, in general, conditions promise to get better or worse. It is intended to show the directions and intensity of change over a 10-year outlook and to identify what the key factors responsible might be. This is represented by a statistical projection of a composite indicators upon which best and worst case scenarios as determined by survey respondents (who cover a range of expertise) are reflected. 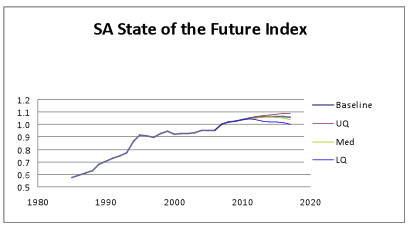 Of the top ten indicators expected to have the highest impact on the future of South Africa according to the survey responses, half are seen to be ones where South Africa is making, or can make, significant positive advances: unemployment, education (secondary school enrolments), access to improved water and sanitation, and crime (homicides). Human capital, overall, emerges as a critical lever that could improve South Africa’s future outlook, and signs are that significant development is achievable in these areas. Of concern, however, are more negative trends evident in the threats of HIV prevalence; national instability linked to socio-economic factors such as inequality, unemployment, and the slow pace of land reform; and water self sufficiency. These reflect areas that require concerted policy and planning attention to avoid worse case future scenarios that are plausible for South Africa. Also of concern are apparent tensions between developments such as the realistic progress attainable in access to water, sanitation and electricity, against concerns about the capacity in natural resources to support expanded use. Achievements in the delivery of these basic services are likely to be affected by increasing resource scarcity, and in turn would increase the pressure on those resources. This represents an issue requiring deliberate policy consideration with an eye on the future. Another example of such a tension is the imminent impact of climate change set against critical uncertainties around biodiversity, water and energy resources. There is a high probability that South Africa will face radical impacts of climate change over the coming ten years, but this is countered with a sense of optimism about what the country could achieve in environmental management. The study considered that significant economic developments (such as a global depression or South Africa’s accelerated growth) and national instability, linked, for example, to frustrations over the land reform programme, are most likely to impact on South Africa’s future trajectory. The catastrophic effects of environmental phenomena such as the radical impacts of climate change or a global or regional health pandemic are also considered to be both probable and of significant impact, and therefore may require strategic consideration. Of the 28 variables examined in the exercise, 19 were independently reflected in the government’s Development Indicators review. Of the top ten SOFI indicators, the only one not mirrored in the Development Indicators is water self sufficiency, a measure of the national capability to supply the water needed for the production of the domestic demand for goods and services. The extent of this equivalence between the Development Indicators and the SA-SOFI initiative is both validating and valuable. It is valuable in that an opportunity is presented to reflect on the current state of these critical indicators, but also to consider their future dynamics and implications within a context or system. It is important that policymakers and planners be able to reflect upon the future directions, dependencies and causalities of these development indicators as a means of assessing policy and progress. Information on SOFI and the SA-SOFI is available on websites of the HSRC (www.hsrc.ac.za), the South Africa Node of the Millennium Project (www.sampnode.org.za), and the Global Millennium Project (www.millennium-project.org). 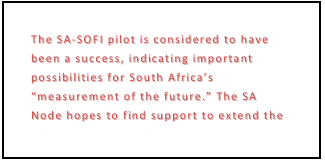 The SA-SOFI pilot project steering committee included representation from the Institute for Economic Research on Innovation, Africa Futures Institute, Institute for Futures Research, the Development Bank of Southern Africa, Department of Science & Technology, National Treasury, and The Presidency.